It is estimated that currently 15,000 vacancies are to be filled in the industry which has traditionally employed women who get a minimum wage around Rs. 20,000.“In the 1970s, we gave Rs.6,000 and there were no vacancies, in the 1990s there were no vacancies, and now when we’re giving Rs.20,000 we can’t even find people,” Joint Apparel Association Forum (JAAF) Secretary General Tuly Cooray lamented.He added that the JAAF’s proposal to the industry has also been for the implementation of automation. “We have to minimize human intervention at all levels of manufacturing to increase productivity by using the resources available optimally,” he said.According to Cooray, Sri Lanka can no longer compete with the rest of the world as a low labour cost destination as it did during the period of war.He also noted that the country cannot keep up with the demand of the world market presently and in the future with the industry remaining labour intensive.Several experts had also previously expressed their belief that if Sri Lanka was not able to provide larger amounts at lower costs, as the markets would look towards alternatives such as Bangladesh and Vietnam.This view has been further cemented by major industry players like MAS Holdings, Brandix Lanka, Hidaramani setting up factories in India and Bangladesh.However, the implementation of automation cannot occur overnight, and has to be undertaken at a significant capital expenditure, apparel sector stakeholders point out. Cooray said that machines could cost anywhere between US$4000-US$15,000 and could range from doing just one process to many, and therefore the projection of the exact cost, and the void automation could fill would be up for debate.He also added that many apparel manufacturers in the country have already begun in house development of machines to suit their specific needs.However, Brandix Market Watch CEO M Raghuraman expressed scepticism.“All I can say is that automation alone in any industry will not address labour shortage problems.”Meanwhile Jafferjee added that the 2 percent hike in EPF payments proposed in the 2015 Budget will also become an additional burden on the industry.This could possibly lead to Sri Lankan manufacturers to further move their operations overseas. 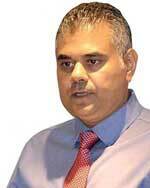 Meanwhile Cooray said that the industry’s targeted sustained growth rate of 12 percent year-on-year could hopefully be reached by implementing automation.Sri Lanka exported Rs.508.61 billion worth of apparels in 2012 and the export income increased to Rs.583 billion in 2013.Apparel exports had generated US$ 3.5 billion for the first 9 months this year, and the industry is expecting to reach US$ 4.8 billion by the year’s end.The Treasury has given the industry a tough task of achieving US$ 8.5 billion exports by 2020.